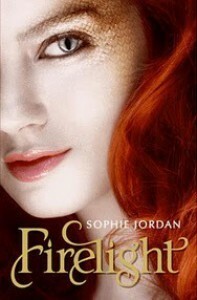 Firelight is an amazing story. I love Jacinda and Will's relationship and to see how the are connected it so wonderful. This is the first book of the series, so it kind of sets up everything and of course ends with a cliffhanger. There are so many twists and turns in this book it's so exciting. I read this book in one day because I couldn't stop reading. I HAD to find out the ending. This book is very good and really relates to Nightshade. I like the concept of Drakis instead of the usual vampires and wearwolves. It's something new and I think that's why it's so great to read about a new species. The Cover: um, is she not beautiful? It's a great cover and I love the colors really bring out the word FIRE.